What It Is: Quinoa is not technically a grain. “It is a seed of the goosefoot plant. The seeds are small, flat and oval, resembling a mix of sesame seed and millet. When cooked, the seed transforms into an interesting shape. The outer germ twists outward to form a small white ‘tail’ that is attached to the kernel. This gives the cooked grain a circular shape,” says Anne VanBeber, Ph.D., R.D., L.D., associate professor and chair of the department of nutritional sciences at Texas Christian University. 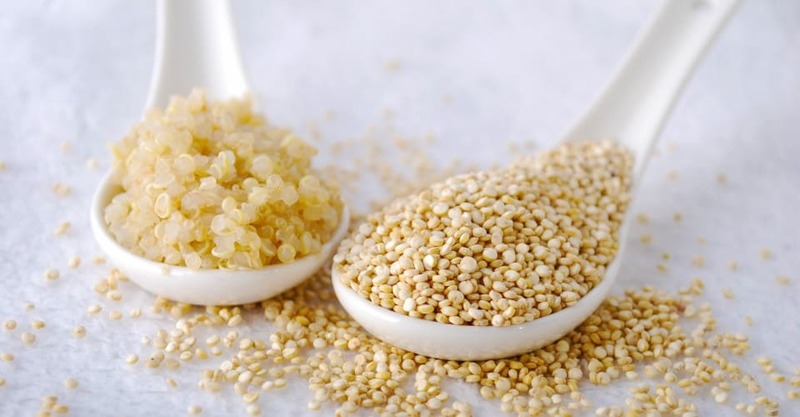 For about 5,000 years quinoa has been a staple food among natives of the South American Andes, who revered it for its outstanding nutritional properties. “It was considered sacred by the Incas, who called it the ‘mother grain,’” says VanBeber. Today it is primarily grown in Peru, Bolivia and Ecuador, where it can withstand the harsh mountainous, high-altitude environment. Texture: When cooked, the inner part of the grain is soft, plump and tender, while the “tail” is slightly crunchy and chewy. Nutritional Information: (¼ cup, uncooked) 159 calories, 2.47g fat, 9.76g carbs, 2.5g dietary fiber, 5.57g protein. Nutrients: (Daily values are based on ¼ cup (uncooked)) Quinoa contains a high concentration of lysine, an essential amino acid, which is usually found in low concentrations in other grains, such as rice. “Quinoa also contains a high concentration of the amino acids cystine and methionine, which are usually low in beans. Thus, quinoa pairs nutritionally well with beans,” says VanBeber. Protein content of quinoa is 12 to18 percent. A 4-ounce serving will provide a child’s protein needs for one day. Quinoa is also a good food source of calcium, manganese, vitamin E, heart-healthy B vitamins (thiamin, riboflavin, niacin and vitamin B6) and insoluble fiber. Additionally, quinoa is a source of omega-3 fatty acids and is considered high in fat compared with other grains. Finally, it has some powerful, important minerals, including 3.93mg of iron (almost 22 percent of daily value), 89mg of magnesium (also 22 percent of daily value), 314mg of potassium (9 percent of daily value), 0.348mg of copper (17.5 percent of daily value) and 1.4mg of zinc (almost 9.35 percent of daily value). Because of the high fat content, quinoa seeds should be stored in the refrigerator to slow rancidity. They should be used within one year of purchase. #Health Perks: “Quinoa is considered a complete protein, because it contains all eight essential amino acids. Most grains are lacking in at least one amino acid, thus categorizing them as incomplete proteins,” says VanBeber. This makes it a good protein source for those on a vegetarian or vegan diet. “It is also being tested in research laboratories as a possible way to curb hunger and alleviate protein malnutrition in underdeveloped countries. Researchers at Brigham Young University have developed a quinoa cookie that has shown promising flavor appeal when fed to Bolivian children,” she adds. Plus, quinoa is gluten-free. Best Served or Cooked With: Quinoa can be boiled into a savory pilaf or added to soups, stews or casseroles as a more nutritious substitute for rice. It can also be eaten as a sweet breakfast cereal. “Not only is quinoa delicious eaten as a hot grain, it can be a tasty addition to cold vegetable salads or bean/grain salads. Quinoa can also be ground into a nutritious flour,” says VanBeber. It can be substituted in a recipe for rice, couscous, millet, barley or any other grain. Most of the quinoa we buy today has already been rinsed to rid it of the bitter saponin coating, particularly if it is from www.bobsredmill.com, www.quinoa.com, www.quinoa.net or imported through Inca Organics. If you’re not sure about the source, rinse it in a sieve until the water runs clear. Saponin, a natural coating that wards off birds and insects, won’t hurt humans, but the quinoa tastes better without it. 1. Heat the oil in a medium saucepan over medium heat and toast the quinoa about 4 minutes, shaking the skillet occasionally, until the seeds are light golden brown. 2. Add the chicken broth and water, reduce the heat to low, and cook 15 to 20 minutes, covered, or until the quinoa is tender. Remove from heat and cool 10 minutes. Drain the quinoa well. 3. Combine the cooked quinoa and all tabbouleh ingredients except feta cheese in a large serving bowl. 4. Combine the dressing ingredients (except fresh mint or parsley) in screw-top jar and shake vigorously to blend. Pour over quinoa mixture and toss until all the ingredients are thoroughly coated. Cover the bowl and refrigerate 4 hours. Let stand at room temperature 20 minutes before serving. Toss with the feta cheese and garnish with fresh mint or parsley, if desired, just before serving. Recipe Nutrition: (1 Serving) 370 calories, 16g fat, 50g carbs, 5g fiber, 13g protein, 56mg sodium. Are all saturated fats bad for you? What about coconut oil? Is it dangerous to heat olive oil? Which is better: polyunsaturated or monounsaturated fat? We asked a few of the country’s leading nutrition experts, and here are their answers. Is it true that you should not heat olive oil? Bottom line: Olive oil is safe to cook with, but don’t deep fry in it. Are all saturated fats unhealthy? There is clear evidence that not all saturated fatty acids are created equal. “Stearic acid, for instance, appears innocuous; it does not raise serum cholesterol or increase the risk of heart disease. This is one of the reasons why dark chocolate is as heart-healthy as it is,” says Katz. So why has saturated fat been vilified? “Most of the demonization of saturated fat is based on the belief that it always raises cholesterol, an argument that has two huge holes in it,” says Jonny Bowden, Ph.D., author of The Healthiest Meals on Earth (Fair Winds Press, July 2008). The fact is that saturated fat doesn’t always raise cholesterol, though it sometimes does. “We now know that there are many more types of cholesterol than just the commonly understood ‘LDL-bad’ and ‘HDL-good’. LDL alone has at least five different subtypes, and some of them (LDL-A) are absolutely harmless while others (like LDL-B) are not. Saturated fat tends to raise LDL, but it sometimes raises the harmless subtype, not the ‘bad’ subtype. It also raises HDL, frequently more than it does LDL, leaving an overall better blood lipid profile than before, even though the total cholesterol number may have gone up,” says Bowden. Additionally, “Cholesterol is turning out to be a very poor predictor of cardiovascular disease and death, as we saw in those trials of the cholesterol drug that lowered cholesterol more than any before but did nothing for heart disease, plaque or mortality. If you take the fear of cholesterol-raising out of the equation, what’s the problem with saturated fat? Not too much,” adds Bowden. However, that doesn’t mean you should start doubling up on the prime ribs. “Some saturated fatty acids are still very much implicated — in particular, palmitic and myristic acid. So red meat is still a concern; choosing meats that are lean, with relatively low saturated fat content is the way to go,” says Katz. Pritikin Nutrition Research Director James J. Kenney, Ph.D., is strongly opposed to any levels of saturated fat in the diet. “There are no naturally occurring fats that are high in saturated fats that do not raise LDL-C (low-density lipoprotein cholesterol), because they contain palmitic, myristic and lauric acids — the three saturated fatty acids proven to raise LDL-C and promote atherosclerosis.” He goes on to argue that the only difference among the LDLs is that in some people some LDL patterns may be less harmful than in others – however they are still dangerous. Bottom line: While no one is suggesting a diet high in saturated fat, limited amounts of whole-food sources such as “eggs, butter, grass-fed meat and the like may not be as bad as we once thought, especially when intake is balanced with plenty of anti-inflammatory omega-3s and phytonutrients from vegetables and fruits,” says Bowden. Coconut oil — can it be healthy with all that saturated fat? “The fat in coconut oil is largely lauric acid, a particularly healthy fatty acid that has anti-viral and anti-microbial properties and is helpful for the immune system. It also contains the fatty acid caprylic acid, which is well known as a ‘yeast’ fighter,” says Bowden. Which is better: polyunsaturated or monounsaturated fat? Polyunsaturated fats include the much-talked-about essential fats known as omega-3s and omega-6s. In general, polyunsaturated fats lower total and LDL “bad” cholesterol, but they can also lower heart-healthy HDL cholesterol – which is not good. “Omega-3s are known for lowering triglycerides, blood fats, and decreasing total cholesterol. They are also helpful for lowering inflammation and maintaining a healthy brain. Although omega-6s are essential for your diet, too much may lead to more inflammation. Corn, safflower, soybean, sesame and sunflower oils, and nuts or seeds are all good sources of polyunsaturated fats. The omega-3 type is found in greatest amounts in fatty fish like salmon and tuna. Walnuts and ground flax seed are also sources of omega-3s,” says Sandon. Bottom line: Both are good in moderation.